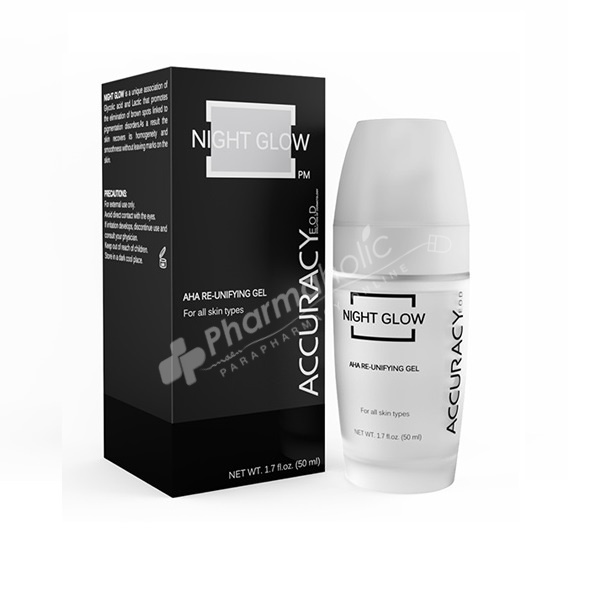 Accuracy Night Glow AHA Re-Unifying Gel promotes elimination of brown spots linked to pigmentation disorders. Before applying the gel, wash your skin thoroughly with a mild soap; dry your skin without rubbing. Apply a thin layer and gently massage the gel over face and neck for 10 sec. Use once daily or as directed by a physician. Aqua, glycolic acid, sodium glycolate, propylene glycol, lactic acid, sodium lactate, polyquaternium 10, methylisothiazolinone and phenylpropanol, polysorbate 80, allantoin, fragrance, EDTA. For external use only Avoid direct contact with the eyes. If irritation develops, discontinue use and consult your physician. Keep out of reach of children. Store in a dark cool place.